Speed Boat, Very Fast with Volvo 2.3 Lt Inboard Engine And Trailer possibly a Bayliner in original red gel coat This boat is very fast and buyers should have some boating experience The sea is cruel and takes no prisoners be warned, a level 2 RYA powerboat qualification is reccommended I bought this boat as a restoration project which is now 90% complete and comes with life Jackets Anchor Rope and Chain the boat was sold to me with a non working power tilt and trim as the whole hydrolic mechanism was missing, I have since had a reconditioned pump fitted and all new heavy duty electrics including 2 new solonoid switches and 2 new heavy duty relays new pipes, unions and new wiring The engine has had an oil change, but I would recommend the stern drive has a new impella fitted and the gearbox oil is changed HistoryThe boat originally belonged to a watersports school which i believe operated the boats on a freshwater lake it has a central stainless ski pole and has previously had a training bar fitted now removed and not included Work needed for completion Boatnew front anchor cleat fitting (supplied)new screws on hud hindges TrailerWhile the trailer is quite solid as it has only had freshwater use it does need the following,New set of rollers, posts and clamps (not supplied)new bracket fitting for jockey wheel (supplied)One of the suspension units is a little down and should ideally be replaced, the trailer seem to be quite safe and I have towed it for 300 plus miles just in the last few months Ideally if i was keeping the boat I would completely strip the trailer and have it galvanized then fit new components I had a quote for galvanizing which was about £120 I have listed this boat very honestly and there is an accompanying video of the engine running from cold showing the tilt and trim in good working order Volvo Penta stern drive units alone second hand sell for 3,000 plus, so this boat is not over priced and well worth it just for the parts alone. BuyersRemember if you press Buy it now then I expect you to buy it at that price for cash not to come and kick tires and to try knocking me down or haddling. If you buy it I expect you to contact me within 24 hours and send a £250 deposit within 48 hours failure to do this and you will be reported to ebay and the item will be relisted. 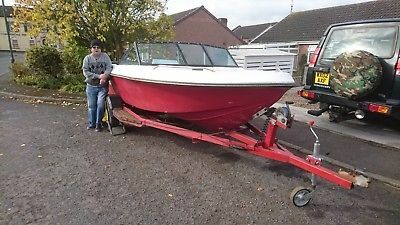 I am sorry to be this strict but I have been cought out so many times by fake buyers just wanting to come and talk about boats (Boatyard Betty’s) or knock me down which is also not fair on other genuine buyers who really do want to buy a boat.